There's just something about the wind in my hair and the breeze on my face that's magic. If I close my eyes I'm flying, free as a butterfly, happy as a lark, with not a care in the world. There's just something magic about swings. I was sitting in the swing on our front porch, surrounded by evening, and held close by Granny Ninna. Lightning was bouncing around the tops of the mountains but the thunder was too far away to be more than a low rumble. There was nothing to fear, not the creak of the swing, not the thunder, not the lightning, nothing. There was only the warmth of Ninna's soft song and the magic of the slight breeze that brushed my face and ruffled my hair. It's one of my earliest memories. During the day the swing might hold Aunt Bett and my mother and they might be talking of the war that was happening in a faraway place called Overseas, but in the evenings, that swing belonged to Ninna and me. It was there she told me stories, the same stories that had once been told to her. It was there she taught me to crochet a chain, it was there she taught me to read, and it was there she held me when I cried. The swing was taken down for winter, taken down and turned upside down beneath the double windows on the front porch; its chains tucked beneath it. But in summer, it's where company gathered after Sunday dinner and told tall tales that I was too little to understand. 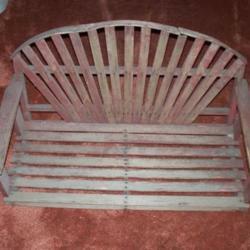 Everybody had a front porch and every front porch had a swing. That's just the way it was in those days. It was the gathering place for adults and a place of magic for children. 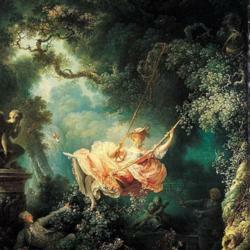 There was something magical about the swing. If I needed quiet, I went to the front porch swing; if I needed comfort, I led Ninna to the swing; when I was sixteen and crazy in love, my boyfriend and I snuggled on the porch swing. It was the place where my heart fell in love. I had other swings growing up. There was the flat board held up by ropes attached to the branch of the maple tree out front. There was another swing, also a board, attached to the rafters of the back porch. The board swings that were attached by rope were twist swings. I could turn myself round and round in the seat of them, winding that rope tight, then let go and the rope would untwist and I'd go round and round like a bird that ate too many ripe pokeberries. And then there was the swing that swung from the apple tree in the back yard. It was handmade for me by my dad's cousin. Swings have been around forever, I think. I like to imagine those ancient folks swung on grapevines and maybe even rigged a grapevine to the rock overhang that created shelter over the front porch of their caves. 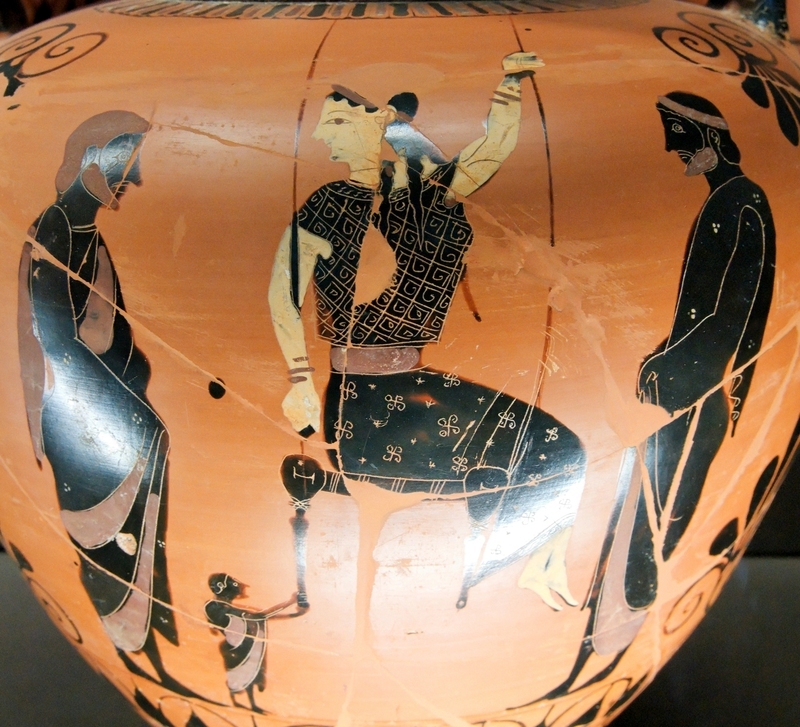 There is a painting on a Greek urn that depicts a swing from as early as about 500 B.C. I've only seen pictures of it, but I can imagine those early swings were as magical as those of my childhood. 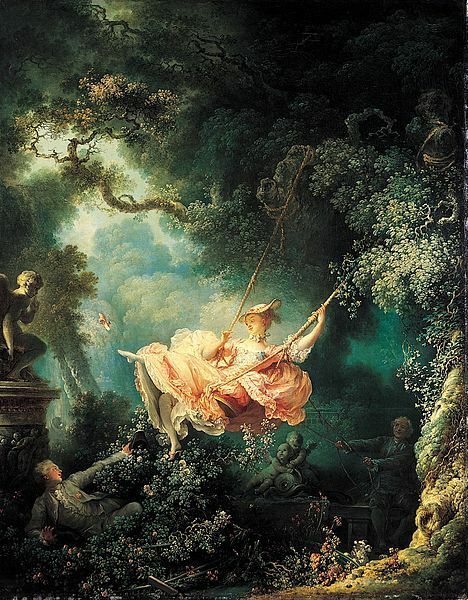 In the 1800's artists like Fragonard realized the magic of swings and painted them into idyllic scenes that we still enjoy when we look at them. And swings weren't just for children. I recently enjoyed swinging beneath the golden fall leaves of a maple tree at the home of a childhood friend in my mountains. Looking up through those leaves as I gently pushed the swing held the same magic for me as it did years ago. The swing has worked its way into our hearts, weaving fond memories and comfort that we can hold on to when around us our world goes a little mad. With the increasing pressure of life and worries that surround us, it's our connection to an easier more carefree time. 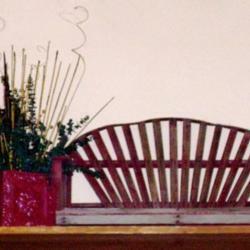 So all those years ago, Dad's cousin built a swing for me. It was a miniature version of the big swing on the front porch. It would hold me, an apple and a book. That's about all I needed. At first it hung from a limb on an apple tree that grew in the back yard. It seems that every summer day a newly dropped apple was waiting for me in the swing. Apples went well with Nancy Drew or maybe the Five Little Peppers. When my brother was born it was a couple of years before he was old enough for a swing set and since I was nearly eight when he was born, I had almost outgrown the little handmade swing. Eventually that swing was attached to chains on the swing set. I like to think my little brother enjoyed it as much as I had, but by then I was all grown up so I didn't swing in it anymore. Later when my children were born, I introduced them to the little swing that was still attached to the swingset. By then it had become a part of my mother's back yard flower garden. There came a time when my children were in their teens, my mom moved to Louisville and my childhood home and a small plot of land were sold to a relative. I never thought much about that swing since I was living in western Kentucky and quite far from the mountains. My children had a swing or two of their own over the years, hanging from a tree or from their swingset. I have always wanted a front porch swing but time passed and the children grew up and I never had a front porch big enough for a swing. 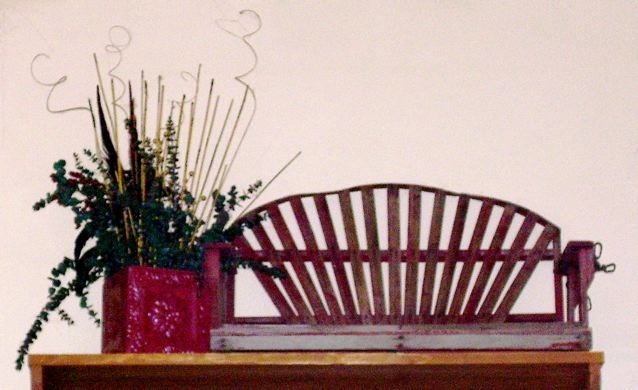 A year ago my brother and sister in law gave me some wonderful memories; the pie safe, Mom's hooked rugs, and that wonderful little swing that was made for me when I was a child. I placed it in my studio. It was well worn, the wood was broken in a place or two, there was hardly any paint left on it, but it still had remnants of the chain that held it to the apple tree and then to the swing set. I looked at it for a year, sitting there all covered in dust and memories in my studio. 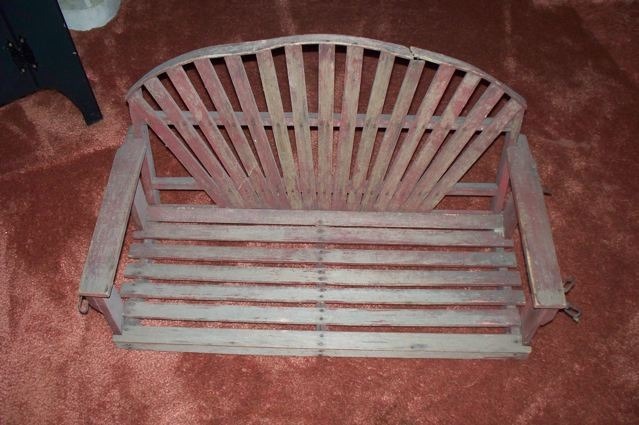 I was going to paint it, decorate it and use it in my garden. But I never did. It just sat there. Yesterday I picked it up, thinking to clean the dust off, maybe doing something with it. The wood was dry, fragile, and without thinking I grabbed a cloth and some oil and started rubbing. All the rubbing and all the oil loosened all the memories and I decided that little swing needed a place of honor, a protected place, a place where I could see it and be reminded of what's truly important in life. I have a shelf over a doorway that goes from my studio into the main part of my house. If I enter the house through the studio outer door, the shelf is the first thing I see. As I rubbed the dry away from the swing, the color came back, red as the day it was painted, glowing in the golden fall sunlight that washed through yesterday's windows. I grabbed my ladder and I placed the swing on the shelf over the doorway. It glows, it shines, it is beautiful! I think we all need reminders. We all need a little magic from time to time. And we all need the comfort we felt years ago when we were surrounded by the warmth and the love we had as children. Swings are magic, no matter where they are. 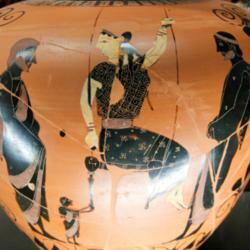 The photos of the Greek urn and of Fragonard's painting are from Wikimedia's Creative Commons.